In this episode, we see how much Regina immediately fell in love with Henry and it makes her a much more sympathetic character. We all knew she had adopted him for all the wrong reasons but it was nice to see that her love for him overcame her selfishness and she kept him. Lana Parrilla does a good job playing someone with that sort of joy and it is completely different from any other sort of joy we have ever seen in Regina. In fact, in this episode, Parrilla delivers right across the board. Seeing Regina in three different points of her life, she manages to maintain the same sort of personality but creates three different tones of voice for her character. It really works and strengthens your feelings about her when she is on Neverland. And Parrilla delivers her best scene with the no regrets line. She was perfect in this episode. Save Henry also told us that John and Michael Darling had been after Henry since the moment he was born and it was interesting to see that their connection goes back so, so far. OUAT often excels at tying different pieces together and surprising us and they do it again here. But they had to have had some impressive fake IDs to get through their paperwork! There are tones of abandonment that run throughout the episode with more than just a few characters having been left behind by their birth parents and sometimes, the abandoned children would do the same thing to their children. What a bizarre path it was that led all the characters to their current places. But the great producers have made that strange path work wonderfully. Although the flashback scenes had some great moments, really ate up too much time. 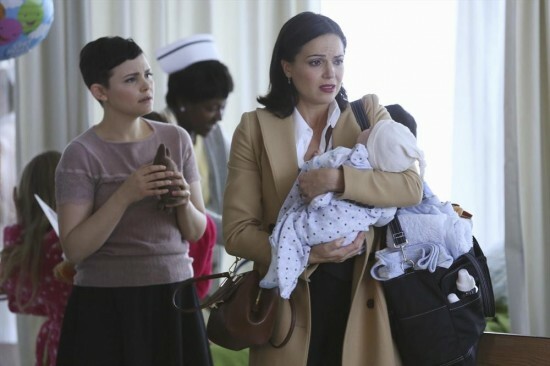 The scenes with Baby Henry crying could have been severely cut down and we would still have gotten the message. I am glad however that we are finally off Neverland. The story on Neverland lasted far longer than it should have ever done and I was so relieved when we saw the Jolly Roger flying away from there. But the twist with Henry nearly ruined the episode for me. While Robbie Kay is great as Peter Pan and it will be fun to see him wreak havoc in the streets of Storybrooke, the fact that the group have already saved Henry only then going to have to save him again later tells me that the whole Pan storyline might go on for far too long. Had Pan body swapped with Charming or Hook or one of the Lost Boys, it would have been more interesting but I think they need to give Henry and actor Jared Gilmore a break after all the work he has done!